These are similar plug-ins that both do "micro pitch shifting" in slightly different ways. Micro pitch shifting was made "famous" by the Eventide H910 and Harmonizers. They take the dry signal and add various amounts of pitch shifted voices and delay in an attempt to let the signal take up more sonic landscape or just for a crazy effect. In all my experiences, the effect has notoriously been used (or overused..) on guitars and vocals. As I mentioned a bit previously, both plug-ins do relatively the same thing, they just have a different approach. Thicken takes the dry signal and creates a stereo processed signal. You can then control the panning, delay, pitch shifting, etc. Widen on the other hand creates 2 separate mono processed signals from the dry signal. Again you have the same control for panning, delay, pitch shifting, etc. After spending some time with these plug-ins, I have to say I like it a lot. They are extremely easy to use. They do a nice job of simplicity and still getting the job done effectively. I go over it a bit more in detail in the video below. I also have some audio examples with both plug-ins. Oh, and the UI's are resizable!!!! 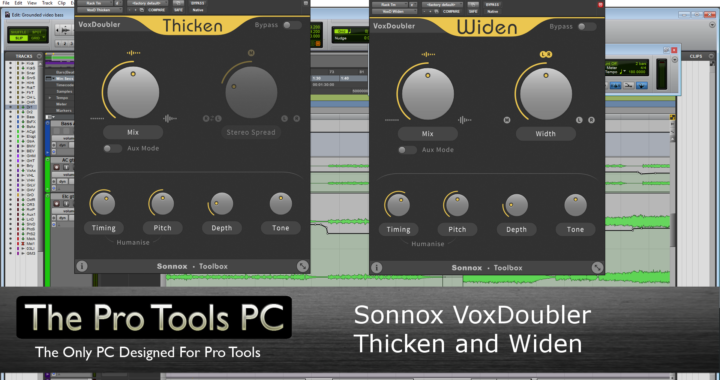 Posted in Plug In Review and tagged AAX, Avid Pro Tools, Pitch Shift, plug-ins, Review, Sonnox, Video, VoxDoubler.